The news that legendary oscar-winning actor Robin Williams is gone at age 63 has been a heartbreaking shockwave. Hearing the media unfold details yesterday about his depression battle and suicide is a sad and tragic loss. Williams was a great talent with Detroit roots. According to an article in The Detroit News, he grew up in Bloomfield Hills, MI and attended Detroit Country Day School. I always felt that Williams was a super talented guy. He had that genius ability to do it all from impersonations, ad-lib, acting in comedic or dramatic roles and everything in between. He has made so many great movies but my favorites include, Dead Poets Society (1989) which I came to appreciate when I watched it again in my late teens. It’s one of those inspiring movies that made a lasting impression on me. In middle school I loved Mrs. Doubtfire (1993) and even as an adult it remains a classic favorite. I also really liked his dramatic performance in One Hour Photo (2002). I use to work in a photo lab and customers would ask me if I had watched the movie or I would get people who would say: “Hey your like Robin Williams in that movie.” The comments use to make me wonder if people understood that the movie was more about loneliness than photography. But it also shows the impact and perception Williams had and created with his characters. I recognize that Williams was a gifted man who was one of a kind. I will always appreciate him for all of those iconic movie roles he played. 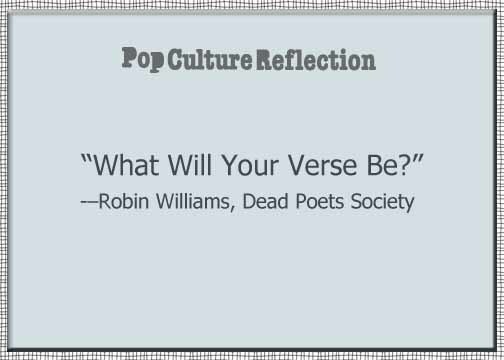 Below is an awesome Dead Poets Society clip shared from Fondablaster’s You Tube Channel.